The traditional view has held that once the Supreme Court makes a decision, that decision becomes the law of the land and cannot be overturned, except through an act of Congress or constitutional amendment. Until Congress acts, lower courts are believed to lack the authority to rule counter to the Supreme Court’s decision. This can lead to poor decisions remaining the judicial law until either the Supreme Court or Congress overrules the decision. This happened in Plessy v. Ferguson, where the Supreme Court ruled “separate but equal” laws were constitutional under the Equal Protection Clause. This decision remained the law of the land for nearly 60 years before the Court ruled against “separate but equal” in Brown v. Board of Education. This mindset can also lead to the waiting game we have seen surrounding ObamaCare since the Court’s decision in NFIB v. Sebelius. Since that decision, upholding the Patient Protection and Affordable Care Act, we have seen plenty of activity trying to get the Court to overrule themselves and declare ObamaCare unconstitutional. However, we have seen little action from Congress or the lower courts on overturning ObamaCare. It is as if people are waiting, and hoping, the Supreme Court will do the dirty work themselves and overturn their previous decision. However, there is another way of looking at the judiciary’s role in deciding constitutional matters. This view holds that the Constitution does not require that lower federal courts follow past Supreme Court decisions in future cases. The use of the term “inferior” in Article III implies these courts are somehow smaller, either in the types of cases they can hear or the area they have jurisdiction over. The term “inferior” also means the courts can be overruled on appeal; however, it does not mean the courts must be subservient or deferential to the Supreme Court. This view further holds that the judicial power is the power to decide individual cases and controversies, not future cases. 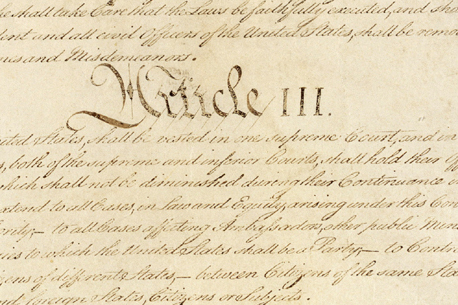 Article III grants this power to decide cases and controversies to the Supreme Court, but it does not grant the Court the power to determine the outcome of future cases. However, federal lower courts should be required to follow Supreme Court decisions in particular cases when they are issued the cases on remand. There must be a final decision in every case, and when a case is in the federal court system the Supreme Court has final decision making authority. Article III vests the judicial power in the Supreme Court and does not require any other federal courts. Therefore, the Supreme Court must have the power to have their decisions followed in each specific case. Courts should be permitted, but not required, to follow Supreme Court decisions. This fits with the Constitution’s structural principle of dividing power and preventing the centralization of power. It also helps ensure federal law remains the supreme law of the land by preventing the Supreme Court from equating itself with the law, and thus becoming a law unto itself. It is better to reach the right conclusion as to law, rather than follow previous decisions, even if it means there may be some discrepancies between the circuits. The Constitution is the supreme law of the land, not the Supreme Court, because of this judges take an oath and are bound to the Constitution, not the Supreme Court. The Constitution created the Supreme Count, not the other way round. Therefore the Constitution has authority over the Court. The job of the Supreme Court is to measure any case before it using the Constitution as a standard. When the Supreme Court re-writes the Constitution, as it did for example in the Dred Scott case when it declared that persons denoted in the Constitution were actually property, it has usurped power that doesn't belong to it. The clay has had the temerity to redefine the potter.